Providing you the best range of stylish pattern printed silk designer sarees, designer printed silk sarees, digital designer printed sarees, printed classical designer sarees, classical elegance designer printed sarees and fancy designer fashionable sarees with effective & timely delivery. The Complete Printed Stylish Pattern Printed Silk Designer Sarees are crafted with excellence with outstanding work that reflects the dexterous craftsmanship of our designers. Designed in various exciting colours and stylish patterns, our offered saree sets an exemplary standard in fashions industry. Our offered range is highly acknowledged in the market, owing to its attractive prints and smooth texture. Additionally, we lay special emphasis on overall quality of the entire range while fabricating it. As an acclaimed entity, we are engaged in offering a distinguished range of Designer Printed Silk Sarees. The range offered by us is checked on various parameters under the guidance of our experienced designers. Owing to features like smooth texture, attractive prints and glossy finish, our offered range is widely appreciated by our clients. We provide an exquisite range of Digital Designer Printed Sarees which are ideal to enhance the beauty of a women. These Sarees are manufactured by fine quality material, which ensures its best quality. Our range of Digital Printed Sareesare available at market leading prices. Designed as per latest market trend, these sarees are intricate and exclusive. Our sarees are admired for their fantastic color combinations and alluring patterns. We offer wide collection of Printed Classical Designer Sarees in different colors, prints, and embroideries. 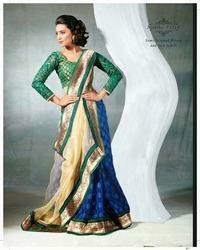 These Sarees are designed with utmost precision in tune with the prevailing markets trends and clients' requirements. Owing to their alluring designs and patterns, these Sarees can be worn at semi-formal and informal events. These Sarees are available with us in different color combinations and designs addressing multifarious demands of the clients. We are widely appreciated for offering magnificently designed collection of Classical Elegance Designer Printed Sarees. These Sarees are designed with utmost precision in tune with the prevailing markets trends and clients requirements. Owing to their alluring designs and patterns, these Sarees can be worn at semi-formal and informal events. These Sarees are available with us in different color combinations and designs addressing multifarious demands of the clients. We manufacture and supply a wide range of fantastic Fancy Designer Fashionable Sarees These are manufactured under the vigilance of our designers by using best quality fabric and advanced methods. We stringently test them to adhere to international industry standards and as per the client’s demand. Our products are available in different and pleasant designs as per the clients choice. we are offering a wide array of very Fantastic Fashionable Designer Sarees that is designed as per the latest fashion trends prevailing in the industry. These are elegantly designed and developed following the latest fashion trend and using best available technologies. These sarees are fabricated using premium grade raw material that is sourced from known and reliable dealers. 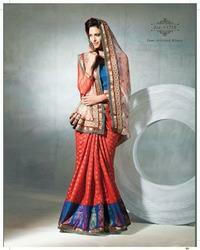 We are involved in designing and developing a Fashionable Fantastic Designer Sarees range of Designer Sarees. Our entire range of sarees are widely applauded for excellent finish, fine embroidery work and neat stitching. Our sarees are very comfortable to wear and available in various soothing color combinations and patterns. 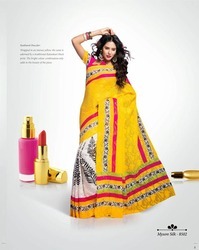 We are engaged in offering a distinctly unique collection of Designer vibrant design sarees to the customers. These Designer Sarees are praised due to striking designs, patterns, and embroidery work done by our team of designers. Here, our expertise lies in making these available in vibrant colour combination that delivers an aesthetic appeal and make these perfect choices to be worn in different occasions. We offer an elegant blend of class & style, in our range of Designer Sarees. These sarees are in wide demand in the market due to their excellent quality of fabric, flawless workmanship and tempting designs. These are manufactured under the vigilance of our designers by using best quality fabric and advanced methods. We offered Classical Designer Printed sarees are designed using high grade fabric. These are made available by our expert artisans in contemporary designs that match up with the specific taste and fashion trends prevailing in the market. Our Sarees are highly demanded among the clients for their qualities like neat stitching, shrink resistance, smooth texture and colorfastness. Clients can avail these sarees at market price.